I have a very soft spot for sliders. I have some classic white puma ones, I have a pair that are covered in sequins and have pow wow written on them and I have admired several fluffy ones in the shops. And then I found that Adidas let you custom make your own. Hallelujah. The first test was creating a pair for my dad’s birthday, he’s a fellow fan. I designed him a classic black base, white leather strap and had Raymondo stitched in black. The end result looked the business and I was super jealous that I hadn’t managed to get any for myself. Fear not. I rectified that problem. But I was smart about it. You see, Al’s birthday coincided with the wedding and I wanted to get him something he could use in Antigua as a present. Enter stage left, slides. I made his with a black sole, khaki strap and had Coates embroidered in gold thread across the top. Amazing. But I didn’t stop there, because you see, I too was going to become a Coates on said holiday. And I too wanted a pair of slides. So I only went and ordered myself the exact same pair but I kept it a secret from him and everyone other than my mum. I gave Al’s to him on the first day of the holiday so he’d get maximum wear and he bloody loved them. As did everyone else. In fact, our friends and his family were so impressed they commented that I needed my own pair. Little did they know. 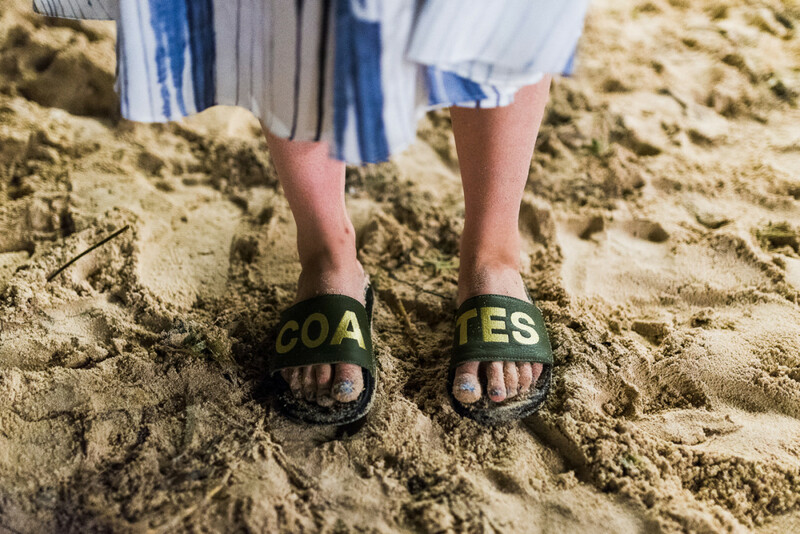 Until, pow, the evening of our wedding, after I officially became a Coates, I busted them out under my wedding dress, on the beach. And yes, we were that couple on holiday, wearing matching slides. And no, we didn’t care one little bit. Photo taken by Paul Mockford.